The term rhetoric refers to language that is used to inform, persuade, or motivate audiences. Rhetoric uses language to appeal mainly to emotions, but also in some cases to shared values or logic. Examples of rhetoric can often be found in literature, politics, and advertising for specific emphasis and effect-incorporating a variety of figurative language techniques depending upon the desired result. The study of rhetoric dates back to ancient Greece. According to Aristotle, rhetoric uses three primary modes of persuasion: ethos, logos, and pathos. Ethos appeals to the character of the writer or speaker-stating that his or her background, credentials, or experience should convince you of the accuracy of the argument. Logos appeals to logic or reason-often citing facts, figures, and statistics. Pathos appeals to emotion, empathetic responses, or shared moral values. Our Examples of Ethos, Logos, and Pathos article explores this topic in greater detail. For now, let's look at specific examples of rhetoric used in different forms. "I am assured by a very knowing American of my acquaintance in London; that a young healthy child, well nursed, is, at a year old, a most delicious, nourishing, and wholesome food; whether stewed, roasted, baked or boiled, and I make no doubt, that it will equally serve in a fricassee, or ragout." "I said, "Who killed him?" and he said, "I don't know who killed him but he's dead all right," and it was dark and there was water standing in the street and no lights and windows broke and boats all up in the town and trees blown down and everything all blown and I got a skiff and went out and found my boat where I had her inside Mango Key and she was all right only she was full of water." "It isn't very serious. I have this tiny little tumor on the brain." "What happens to a dream deferred? Does it dry up like a raisin in the sun? Or fester like a sore-And then run? Does it stink like rotten meat? Or crust and sugar over-like a syrupy sweet? Maybe it just sags like a heavy load. Or does it explode?" 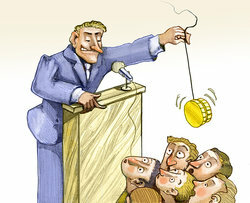 Political speeches often use rhetoric to evoke emotional responses in the audience. One famous example would be Martin Luther King, Jr.'s I Have a Dream speech. "Let us not wallow in the valley of despair, I say to you today, my friends. And so even though we face the difficulties of today and tomorrow, I still have a dream. It is a dream deeply rooted in the American dream." Referring to the United States White House as the president's "playground" would be a tactic of rhetoric used by a person in opposition to the president to persuade citizens that the president is incapable or incompetent and uses his power inappropriately. Often the concept of patriotism is used as rhetoric, in that if one does not subscribe to a certain belief or concept, he or she is referred to unpatriotic in an attempt to persuade others not to follow the footsteps of the "unpatriotic." The change of wording of some labels in order to make concepts more palatable is a form of rhetoric. For instance, the term "illegal immigrants" has replaced more neutral terms such as "undocumented workers" or "migrant farm workers" to increase the stigma placed on individuals or to make future legislation regarding the status of individuals more palatable to sections of society. The purchase of Alaska was referred to as "Seward's Folly" by those in opposition to the purchase. The use of the word "Folly" was intended to be negative and degrading in order to persuade the public that the purchase was an ill-informed decision. A medicine ad claiming that more people choose its medicine than a competitor is using rhetoric that is a logical fallacy - the fact that more people purchased the medicine does not speak to its effectiveness and worthiness of purchase. An advertisement for a food product for children that espouses that "Moms who love their children, buy [name of product]" uses rhetoric by persuading parents that not buying that brand of product may imply they do not care as much for their children as other parents. An advertiser or salesman for insurance may use rhetoric to make it seem that the buyer would receive less service or support for damage with other insurers in order to persuade a consumer to buy their brand of insurance. An advertisement for canned soup may show a child smiling and eagerly eating their soup after pushing away another brand to imply that even picky eaters will enjoy this meal, knowing parents of fussy eaters will try anything to get their kids to eat. Although rhetorical devices serve a valuable purpose in making effective arguments, rhetoric can also be used as a tool of deception. Knowing how to identify examples of rhetoric can help prevent you from being inadvertently deceived by the persuasive nature of language. Can you think of other examples of rhetoric? Comment below. "Examples of Rhetoric." YourDictionary, n.d. Web. 23 April 2019. <https://examples.yourdictionary.com/examples-of-rhetoric.html>. The term rhetoric refers to language that is used to inform, persuade, or motivate audiences. Rhetoric uses language to appeal mainly to emotions, but also in some cases to shared values or logic. Examples of rhetoric can often be found in literature, politics, and advertising for specific emphasis and effect—incorporating a variety of figurative language techniques depending upon the desired result.